KSAT 12 meteorologist Mike Osterhage says to expect a wet morning commute and more showers on Wednesday. The storm that dumped the heavy rain and large hail has moved out, Osterhage said, but more showers and a few storms will continue to move through this morning. Eventually there will be some clearing West, with leftover showers moving east. The high today will be 75°. It will be partly cloudy the next couple of days Osterhage said, then the showers and storms return this weekend. Flooding should also be expected in low water crossing spots. The National Weather Service says patchy light rain will continue over portions of south-central Texas, with additional rainfall amounts of less than 1/4 of an inch through 5 a.m.
Click here to watch Live Doppler Radar. Large, damaging hail fell across the San Antonio area Tuesday evening, leaving behind damage to cars and homes. A strong hail core moved through downtown just before 10 p.m. and pounded the area, including the KSAT 12 studios. 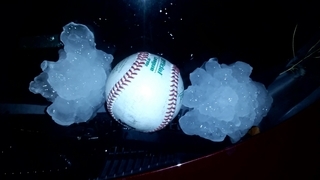 KSAT 12 News has received multiple reports of hail the size of baseballs and larger. All of the KSAT 12 viewing area and much of South Texas is under a severe thunderstorm watch until 1 a.m. Wednesday. Showers and storms will continue to develop Tuesday evening with widespread storms likely into the night. Storm chances increase with each passing hour and will peak around midnight. The biggest threat Tuesday night is wind and hail. A few storms could become severe with straight-line winds up to 60 mph and/or hail the size of golf balls. UPDATES: Scroll through the KSAT 12 Weather & National Weather Service Twitter feeds below for the latest up-to-the-minute severe weather updates. With the threat of severe storms in the forecast, power outages are possible throughout South Texas and San Antonio. Heavy rains may for roads across San Antonio and South Texas to close. Click the links below for current road closures. Get the KSAT Connect app and be part of the KSAT News Team! It’s the easiest way to share pictures and videos with KSAT. See a possible news story? There’s a pin for that. Have a pet pic? There’s a pin for that. Got some serious Spurs spirit or is something driving you crazy in your neighborhood? There are pins for that, too! Drop a pin, share your pictures and we could use your pictures on the air! Android Devices click here. iOS Devices click here. Keep up with the latest from the KSAT 12 Weather team on Twitter and Facebook.